Mince about 3/4-1c mint and set aside along with a few leaves for garnish. Fill a large stock pot or dutch oven with enough water to cover chicken pieces. Add 1/2 tube orange juice concentrate, orange ends (peels too), remaining mint, chipotle, adobo sauce, and salt/pepper to taste. Bring to a boil and add chicken carefully. Poach about 15-20 minutes, or until chicken is creamy white and cooked through. Leave in pot and do not drain. Remove 2/3c poaching liquid and the chipotle and place both in a saucepan (or, if dirty dishes are to be avoided, drain chicken and re-use the poaching pot). It will quickly come to a boil again. Add chopped mint and cook for 1 minute. Add wine, cream, honey, salt and pepper. Cook until the sauce thickens a bit, about ten minutes. Add vinegar and more salt/pepper to taste, if necessary. At this point the sauce is finished; however, if you prefer a thicker sauce, prepare a roux and add to the saucepan (mix 1T melted butter and 1T flour together in a small dish; I like to cook my flour first in a small, hot pan until it browns, which removes the flour taste and replaces it with a nice, nutty flavor; but if we’re focused on eliminating excess dishwashing opportunities for the kids, the roux doesn’t get cooked), cooking an additional few minutes. You may serve the sauce as-is, or use a submersion blender to make it creamier and smoother. 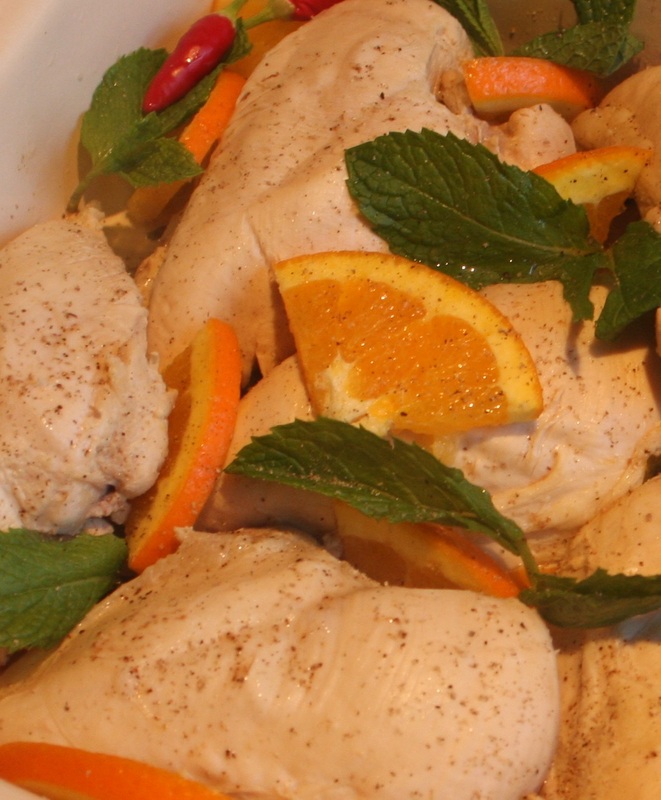 Serve chicken atop sauce, topped with orange slices. Pass additional sauce. * Orange juice concentrate: while fresh juice is usually preferable, concentrate is great for weeknight poaching.